Kubera is regarded as the god of wealth and ruler of the northern quadrant of the universe. One of his attributes is a cup for holding liquor, of which he is very fond. He can also be identified by his distinctive posture, in which he sits on his haunches upon a low seat. His potbelly manifests his well-being and good fortune. 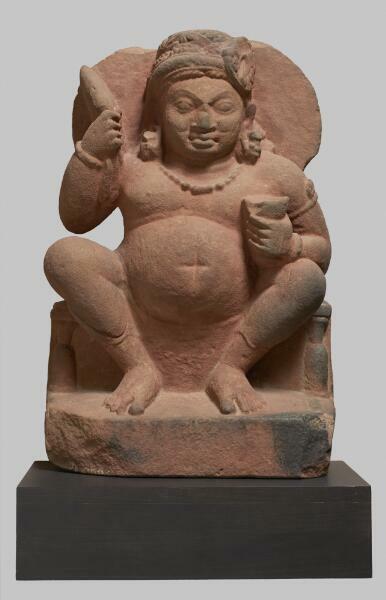 This pot-bellied, gnome-like male figure squatting on a low chair represents Kubera. He is worshipped as the god of wealth and riches and the regent of the northern quadrant of the universe. Originally an earth spirit of ancient Indian folklore, Kubera was assimilated into the Buddhist, Hindu, and Jain pantheons. It is not clear which religion this image was created for. Devotees associate Kubera with virility and generative power, and his name is often invoked at weddings. From the 1st to the 6th centuries, Kubera was commonly depicted holding a moneybag with coins spilling out and a cup for liquor. Here he grasps a cup to his chest. But instead of a moneybag, he holds what looks like a radish, its leafy stalks hanging downwards. The vegetable is appropriately shaped for a god of fertility. His identity as Kubera is affirmed by the asymmetrical placement of his turban crest, a prescribed attribute of the god of wealth.